“Are we going to have the Pui Chingri Ghonto as part of the dinner as well? If so, then I will skip the dinner!” It was my mom who asked the question. She was furious with me for God knew what reason. Okay, I knew it why but I decided to ignore that! I was juggling with several bowls full of food for more than one hour to click a few pictures of the said Pui Chingri Ghonto. Maa was bored seeing the same and also was not at all happy with me. After all, it was 2.30 p.m. and everyone including Pasta was waiting to have the Sunday lunch. Another reason was more dangerous. I did place the food on my bed to click the pictures and Maa was horrified 😛 . Actually, I was quite excited about a few aluminum utensils I purchased around a month back. I wanted to use the utensils with a homely comforting dish to shoot. These type of utensils are still in use in my mother’s place and specifically for boiling the milk. Upon cooking the Pui Chingri Ghonto, I was tempted to use the utensils to capture this humble yet tasty Bengali delicacy. 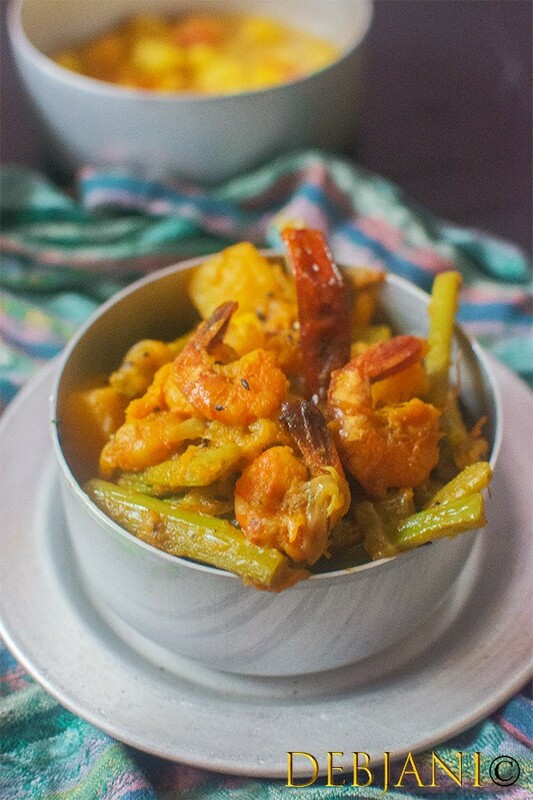 Coming to the Pui Chingri Ghonto, it is a humble Bengali style mishmash prepared with Malabar Spinach, Potato, Pumpkin, Onion, Ginger, Garlic, Tomato and last but not least medium sized Prawns. You may wonder why the name Pui Chingri Ghonto where there is no mention of Potato and Pumpkin. And also, why Ghonto but not Chorchori. Pui Chingri Ghonto or Chingri diye Pui Shager Chorchori! Ghonto vs. Chorchori! Both Ghonto and Chorchori are the different form of dishes from Bengali Cuisine. 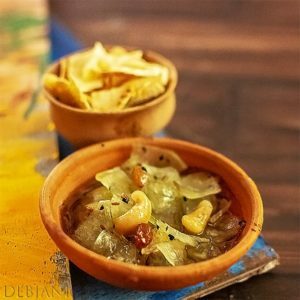 While Ghonto is a kind of Mishmash; Chorchori signified by the chunks of vegetables. Cut of the vegetable is very important in Bengali Cusine. A Dalna cut is different than Shukto and the Shukto cut is different than Ghonto or Chorchori. 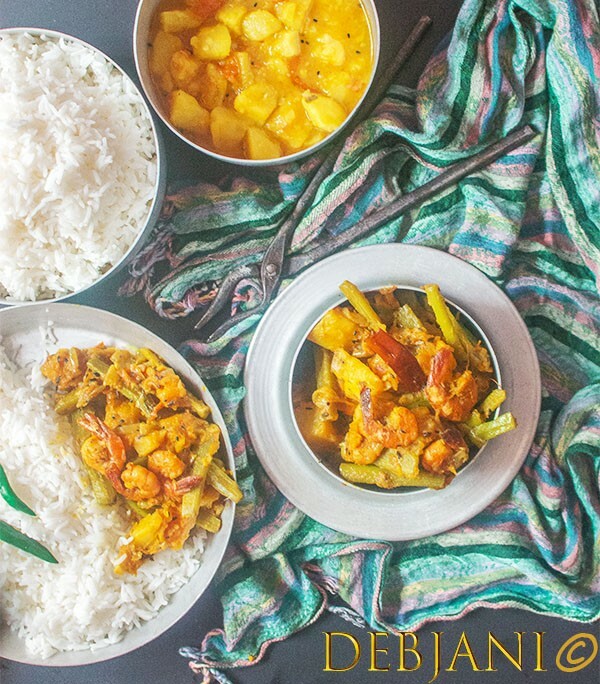 The famous Bengali cookbook Niramish o Amish Ranna book by Prajnasundari Devi is having a great note on the difference between the vegetable cuts for Bengali Side dishes and the difference between different Bengali side types. Pui Shag aka Malabar Spinach and the mix and matches! Though considered rich if cooked with Fish/ seafood, however thanks to Pui Shag, we have some signature dishes. Be it Chanchra, be it the Pui Saag diye Masoor Daal or be it the recipe I am writing here now, Pui Chingri Ghonto, all the dishes calls for Pui Saag. Finally the Pui Chingri Ghonto! 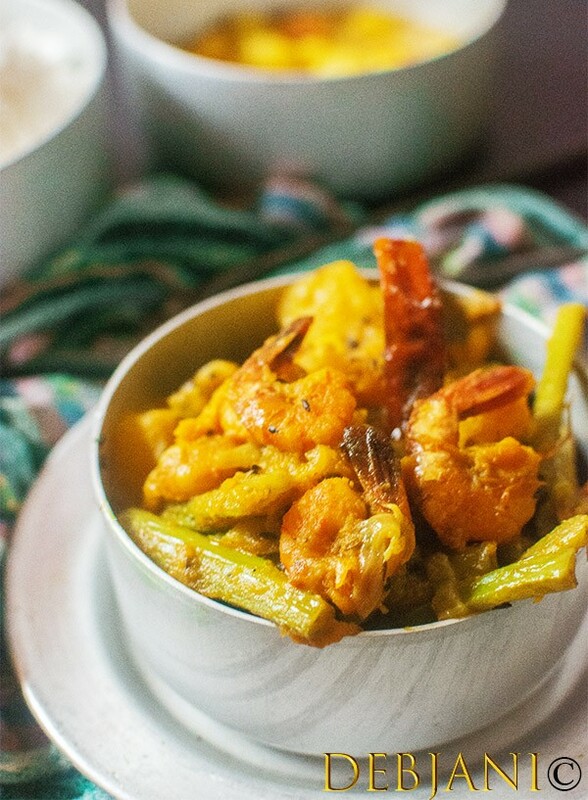 As I already have mentioned, Pui Chingri Ghonto is a Bengali style Mishmash prepared with Malabar Spinach and a few more vegetables and obviously Prawns. The recipe calls for a traditional tempering with Panch Phoron as well. Rest is a few spoonfuls of rice along with the Pui Chingri Ghonto and a bowl full of Dal and then the life is good. 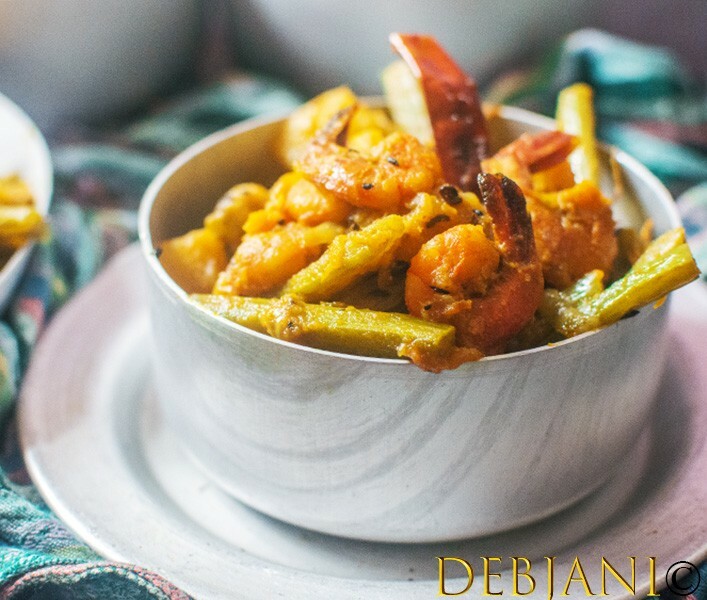 However, the dish is spicy and rich, calls for mustard oil and the combination of Malabar spinach and Prawn is a bit heavy. One of the reasons we generally don’t eat this for dinner. For that matter, Shaag aka the greens is not cooked much in dinner in the Bengali Households. Now that I am done with the subsidiary details; here’s how you make the Pui Chingri Ghonto. 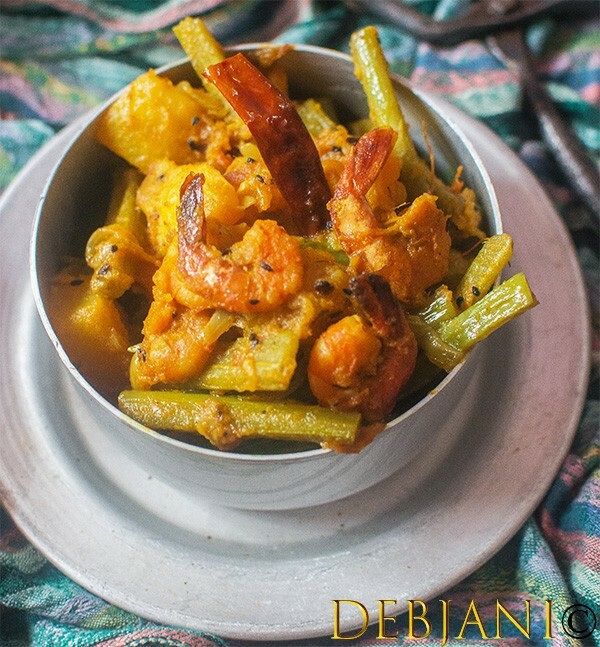 Pui Chingri Ghonto aka Malabar Spinach Mishmash with Prawns (with Potato and Pumpkin) is a Bengali style mishmash prepared with Greens and Prawns. Panch Phoron Powder/ Bengali Five Spices Powder: ½ Tsp. Mustard Oil: 3 Tbsp. + 1 Tsp. Wash and clean the Prawns keeping the tail intact. 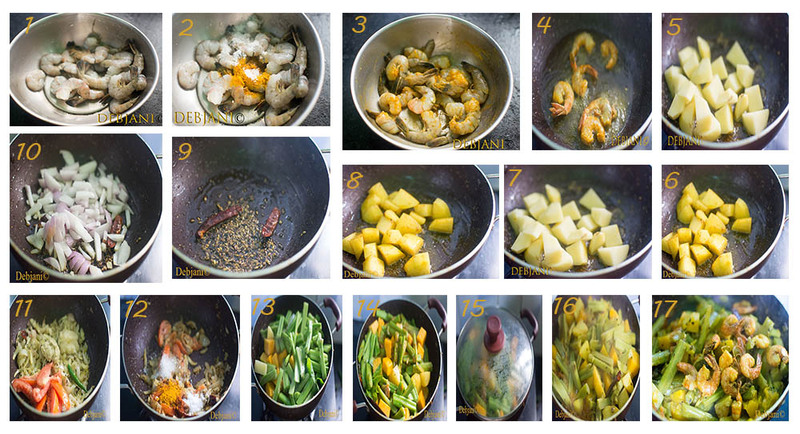 Marinate prawns with ½ Tsp. Turmeric Powder, and Salt. Wash Malabar Spinach aka Pui Saag several times under running water and cut the stems into long strips. Peel the potato skin and cut the potatoes into small cubes. Peel the skin of Pumpkin and cut into small cubes as well. Cut Onion and tomato roughly. Fry the Prawns and strain from the oil. Now Fry the Potatoes as well till those turn golden brown in color. Temper remaining oil with Dry Red Chili and Panch Phoron. Add Onion and fry till those turn translucent. Don't fry onions much. Now add chopped tomato, ginger and garlic paste and green chili and cook till the raw aroma of the veggies oozes out. Add Turmeric Powder, Panch Phoron Powder, Sugar and Salt and mix thoroughly. At this point add the Malabar Spinach, fried potatoes, and Pumpkin and give a thorough mix. Cover the pan with a lid and cook till the veggies soften on low flame. The Greens will release moisture which will be enough to cook the dish. No need to add extra water. Once done, add friend prawns and again cover the pan and cook for 5 more minutes. The end product should be little mussy. Add 1 Tsp. of Mustard oil to finish the dish. Serve it hot with Steamed Rice and Daal. Panch Phoron Powder is optional, however, gives both aroma and flavor to the dish. You may substitute mustard oil with vegetable oil, however, Mustard oil gives the perfect punch to the dish. Last but not the least, instead of Prawns Shrimps can also be used. 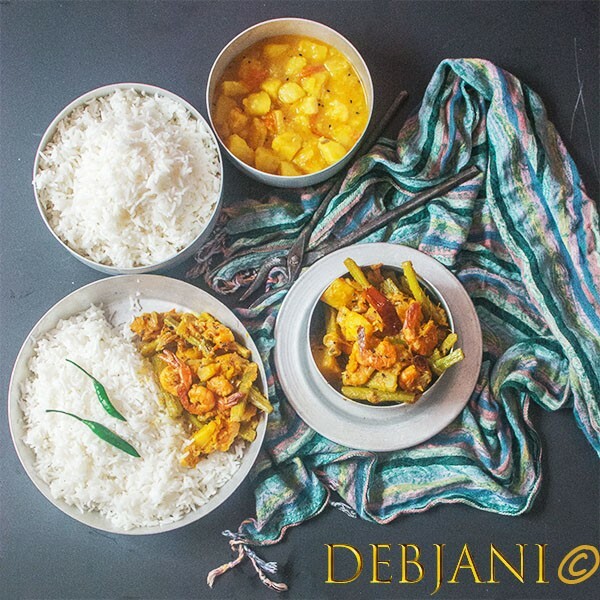 A few traditional Bengali Side Dishes From Debjanir Rannaghar apart from Pui Chingri Ghonto! 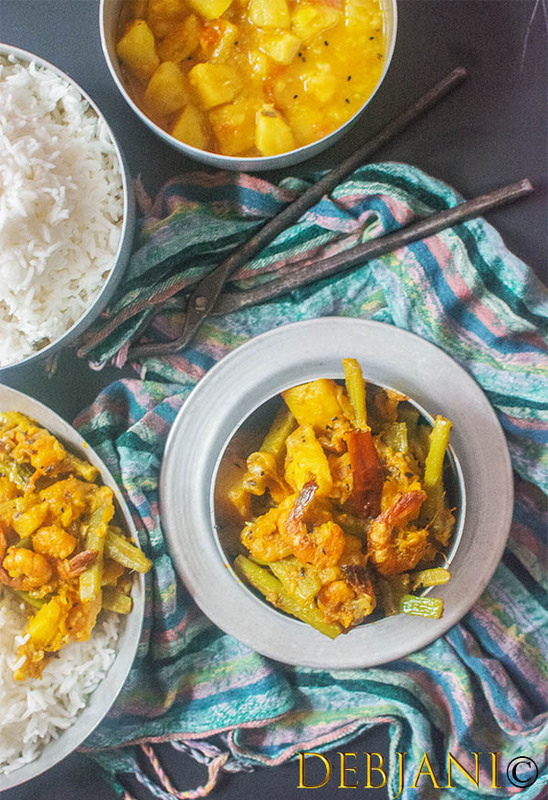 Have you tried the Pui Chingri Ghonto Recipe from Debjanir Rannaghar!